Roberts unveils its new £80 Sports DAB II portable radio | What Hi-Fi? It's ideal for when you're out and about, in the garden or even at work. Fitted with a DAB/FM tuner, it has a full screen or rolling text display. A rechargeable battery comes as standard, as does a headphone socket and speaker. An AC adapter, DC input socket and automatic shut-off also come as part of the package. 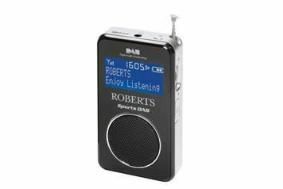 The Roberts Sports DAB II is finished in black with a blue backlit display and costs £80.